The Hotel Les Tritons is a 2 Star Hotel in on the Coast of France. Features include swimming pool, near a beach. Ideal for exploring Coastal France. Welcome to the Hotel Les Tritonsin Sete. 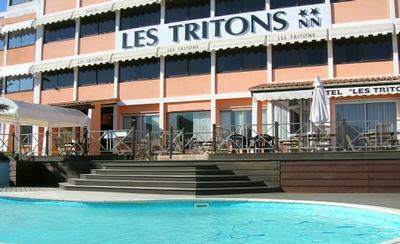 Hotel Les Tritons is located in the heart of Sete just 100 metres from the beach. It offers an outdoor swimming pool and a wellness centre. The guestrooms feature a view of the sea or Mont Saint Clair. For more information on the Hotel Les Tritons on the Coast of France please click on the availability link above and below. L'hotel Les Tritons est situe en plein coeur de Sete, a seulement 100 metres de la plage. Il dispose d'une piscine exterieure et d'un centre de bien-etre. Les chambres offrent une vue sur la mer ou le Mont Saint Clair. The Hotel Les Tritons, 2 Star Hotel is in Sete, Herault, Languedoc-Roussillon, France. The address is 8 Boulevard Joliot-Curie, Sete, 34200.